The below communication which is also attached as doc could be forwarded to all your members to enable them comply with the Track & Trace portal requirements. 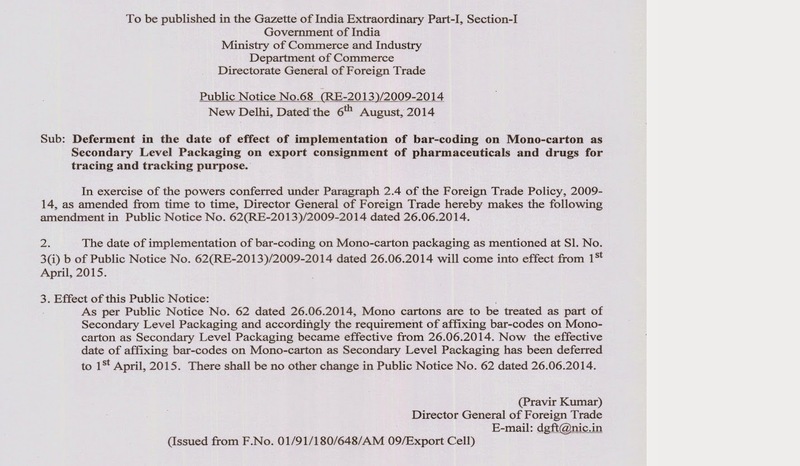 As you may be aware, The Directorate General of Foreign Trade (DGFT) has notified that all drugs and pharmaceutical products that are exported from India need to implement a track and trace system using barcodes as per GS1 global standards. As part of this track and trace system, a National Track & Trace Portal is being set up for the purpose of compliance with DGFT’s requirements for exported drugs and pharmaceutical products across various packaging levels. The following product packaging level indicator digits need to be used by you in the GTIN’s (Global Trade Identification Numbers) for your products. (The indicator digit refers to the first digit of a GTIN-14). Will denote the Secondary packaging level. In the event of multiple secondary packaging levels, only the first level of secondary packaging requires to incorporate the packaging indicator number. To help companies prepare and be compliant with these product marking and coding requirements, GS1 India shall be providing technical guidance through workshops at select locations (as below) and internet based webinar training sessions. Please register for any one of these upcoming training sessions immediately by emailing us at workshop@gs1india.org. We have limited seating capacity so please reserve your spot today. At the training workshops, guidance shall also be provided on how to ensure scannability of barcodes in a variety of scanning environments using barcode verification service provided by GS1 India. For any additional questions or clarifications on these product marking and coding requirements please contact us atimplementation@gs1india.org.